Wind Country - Hidden Village of Sand - Engi no Jutsu - The Best Naruto RP on the Net! Those were the words uttered by a man three-hundred years ago who had a vision for the future; Daisai Sougi, thought to be eccentric, hypothesized and laid out plans for travelling deep into the west land deserts and create a village. Most thought it useless and futile – how could they survive in an infertile, arid environment? No matter how vehemently Sougi attempted to persuade his peers of the benefits from living in the desert, the only replies he received were mockery and contempt. Eventually the people began to ignore the man, though this isolation only served to strengthen Sougi’s resolve. Packing up and heading out with family and several close friends, he marched into the merciless desert, seeking to prove the people wrong. Soon after, though, Sougi’s confidence and determination began to wane, for there was no sight of the rumoured desert animals, and plants were extremely scarce, present only in the form of cacti and tumbleweed. Just as he was about to resign his efforts and head back, the rain began to fall for several hours. Huddling together under their flimsy tents, the excursion group waited out the rain. Plants began to grow, and water pooled together on the hard sandstone rocks; excited at the new life given to them, they began to build houses and establish their own community. Within weeks, however, everything began to die. The few plants they had shrivelled from the heat while the reservoir of water they depended upon dried up. Despite that, Sougi did not give up. Having witnessed the miracle of what rain could do to the desert, his hopes and confidence soared because he knew it was now possible to survive. It did not rain for many months, but Sougi and his company were able to live reasonably off of underground pools of water. Nearly a decade past, a decade of hard labour and sweaty days underneath the blazing sun; Sougi and his followers toiled endlessly to build up the foundations of what would be one of the greatest villages in the history of mankind. 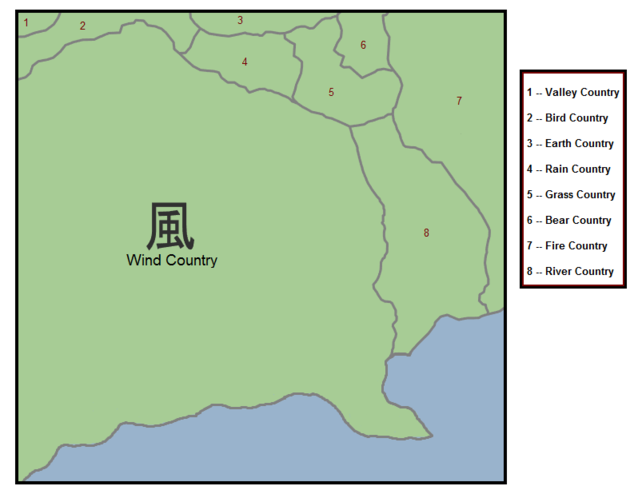 The first village of Wind was set in place. Based within the treacherous conditions of the desert, it was safe from bandits and would-be invaders; they nestled it within a cradle of mountains with four exits: north, south, east, and west. The natural sandstone walls protected them from the volatile sandstorms. Now and then travellers would come, worn out by the hardships of their sojourn, and decide to stay within their walls. Wandering Shinobi settled in as well, spreading their training throughout the flourishing community; Sougi was promptly established as the Shodaime Kazekage of their newly christened Sunagakure. Hidden Sand was born. When time came for Sougi to pass, he passed on his mantle to his eldest son, who became the Nidaime Kazekage and followed in the footsteps of his father’s governing. To set themselves as one of the strongest villages around – for other Shinobi villages were sprouting about this time as well – a law was passed, decreeing all firstborns in a family were required to enrol in the Shinobi Academy (barring extraneous circumstances cleared with the government). Inspired by the success of Sunagakure, other villages began to rise in the desert as well: Enkaku, Gion, Garasu, Bouryoraku, Doshaburi, and so on. A daimyo rose to power to govern over the non-Shinobi population, and a council of fifteen members was instated to rule over the majority of Wind. Each village elected a representative, and the rest were filled by Shinobi veterans and the Kazekage himself. Time passed as the torch of the Kazekage was handed down; Sunagakure was a prosperous village, mighty and forbidding…that is, until an infamous Chuunin Select Exam one-hundred years ago. The residing Kazekage was assassinated and impersonated by a traitorous Leaf nin; under the command of this traitor, Sunagakure was lead blindly into an all-out assault against Konohagakure, aiding Sound forces wherever possible. However, the actual body of the Kazekage was discovered soon after; Sand had fallen from grace in the eyes of the public, and they declared a truce with Leaf. Things did not get better for the desert village. A mere three years later, the fifth Kazekage – Godaime – was abducted by hostile forces. As compensation for an earlier act of assistance, Leaf sent a team of Shinobi to help Sand in recovering their beloved leader. During this time, knowledge of the Sandaime Kazekage’s fate was discovered; while thought to have mysteriously vanished, he had actually been killed and turned into a puppet by a former puppet-creator of the village. Yet another fatal blow to the reputation of Sand. And yet it continued to spiral downwards. Less than fifty years ago, security grew lax and inattentive; the standard of Suna nin had declined compared to the other countries. Much of the blame was laid upon the shoulders of the current Kazekage: Kyuudaime. Through several surprising events, though, the Eighth was revealed to have been appropriating the village’s sacred scrolls and selling them on the black market for personal profit. Of course, the woman who revealed the Kyuudaime’s nefarious scheme was named the Juudaime as his successor – the first female Kazekage in the history of the land. It begins, like many things do, with an end. Arisugawa Nayoko was the Kazekage then, a little over a year ago, when the enemies of Sand, an elusive group of extremists with odd, unexplainable powers called the Suna no Soushoku claimed prophecy. They swore to sacrifice the Kage of the day to their God, Assate, and in doing so dominate the sands that their God called home. There was a group of men in Sunagakure then, a secret strike force called the Sasori Ryodan. They knew no morals, no boundaries, only loyalty. But it was a strange, unpredictable sort of loyalty, and when word of the prophecy reached them they struck Arisugawa Nayoko down and killed her rather than risk her becoming the dread God’s sacrifice. Yet the Priests of Assate moved with force across the country; once known for kidnappings, ritual burnings and murders, they became a military force to be reckoned with. The whole of Zoukei, the entire population of one of the largest cities in all of Kaze no Kuni, was kidnapped by the Priests. A member of their group managed to infiltrate the Mujina, and the Sasori Ryodan resorted to a purge of the whole of the clan to get rid of the traitor, and any evidence of the treason. This was a threat that could not be ignored, and Sunagakure needed a leader to face it. Two men vied for the position, Sezaru and Karazame, though both efforts were useless in the end. Tradition demanded that the Kazekage’s heir take her place . . . and though she was believed to have conceived no child, she had. He was a grown man now. Called Enzan, and tutored in the shinobi arts in secret, her illegitimate child came home. Tradition demanded he take Nayoko’s place, but instead the Council of Sand called a vote for the shinobi to choose their leader between the three of them. The contest, many believed, was between Sezaru and Karazame. There was no way, after all, for a newcomer to sway the hearts of Sand enough to convince them to make him Kazekage. The changes he made were unprecedented. Enzan abolished the Council of Sand which had held power over the village for well over a hundred years and made himself a dictator, if not an unpleasant one so far, established SUNA, KAZE and HARI, and kept Sezaru and Karazame close to him as advisors. He rode the momentum of his rise to power, acting on information he learned from Sezaru’s network of ninja—unknown to him, the same Sasori Ryodan that had assassinated his mother—and sent a small strike force of ninja into the secret temple of Assate that the Suna no Soushoku called their home. There were many casualties, but the strike force returned victorious. Enzan marked the day as a holiday in the village, to mark their final triumph against the Priests. Sezaru gathered his Sasori Ryodan together to further analyze the needs of the village one day soon after when a stranger broke into the heart of Sunagakure. He was not caught, but he left a message to the men just outside Enzan’s door before he left. The man said that there was a traitor in his midst. Enzan did not take his word, but what he said had troubled the Kazekage. He researched, asked questions, and the answer startled him. Sezaru, his closets advisor, was the leader of the Sasori Ryodan. A group that existed without his permission, and who, he learned, killed his mother. They were all trapped and killed in their secret tunnels that night, even Sezaru. Months have passed since the Priests of Assate’s stronghold was torn down, and much has changed. A new secret group has been formed, this time with the Kazekage’s consent. The Yagyou thrive today under the leadership of Atsumori, Izumi and Izanagi, and the general public remains unaware of their existence. People are being kidnapped off the roads between the cities, in dark alleys, and sometimes in broad daylight in the city streets. Shinobi are beginning to wage a secret war with an enemy they no longer understand. People are growing frightened again, and when they wonder why, when they think no one can hear people whisper Assate's name in the shadows. Saigowan, a SHINRAI and close confident of the Kazekage, was kidnapped by an unknown group, the famed puppeteer sennin Shichiro left in a coma after the same encounter drew to a close. They rescued Saigowan during a raid and took him home. Shortly thereafter, Minoru broke into the village during one of the Kazekage's speeches. He fought his way into the shinobi prison within the village and let loose every violent criminal that was still alive, chained beneath the earth. The Jailbreak wrought chaos throughout the village. As this was happening Saigowan, who had turned traitor, along with help from Shichiro attempted to subdue and kidnap the Kazekage. They failed in that but Enzan has been lost in a delirious, often violent sickness ever since the attempt. The whole country is reacting to Sand's weakness. Criminals are growing more daring. And through it all there are more kidnappings that no one can explain or trace. With the grace of the Dustmen’s assistance, the once sick and poisoned Enzan made a full recovery and reestablished Sunagakure’s confidence in his leadership. Partnering with said collective of Dustmen, Sunagakure then enacted their final decisive plan to end the long running conflict with Suna no Soushoku. As such, operatives of Sunagakure were split into three different trails to seize information and take down Kijo Saigowan, Hokori Taka and Maeda Asuko. Upon their deaths – except for Taka, who escaped his workshop – and the destruction of many temples of Assate, Minoru entered the village alone to assault the Kazekage and his counsel. Banning together as a unit, every able body of Sunagakure worked in unison to defeat the apostle of Assate, which left most of the village in ruin after having to deflect a large meteor the boy summoned. The aftermath of the battle resulted in the erection of the Fuji Musume – a great wisteria Yddrasil tree built from glass that now hangs over Sunagakure like a canopy of the village’s resolve. With Minoru’s defeat, Renchishin Hitoko arrived at Assate’s palace discovered within the depths of Sangakuchi no Maya – The Hazy Mountains. Greeted by Taka, the newly appointed Sennin is given a choice: either leave Assate sealed within the mountains, or end his legacy there. With a touch of his hand, Assate dies on his throne, severing all connection with Priests worldwide. This event marks the decades long conflict between Sunagakure and Suna no Soushoku. Now, Sunagakure is in a period of rebuilding their village after the battle against Minoru. The Fringe: The land along the northern and eastern edges of Wind is known as particularly fertile ground. No self-sustaining country is all deserts, and this is clear from the developed land in the north. Rainwater is a rare commodity, but the people along the Fringes make do by digging wells and tapping into the plentiful groundwater found along the Fringes, creating a thousand little artificial oases that dot the landscape and enable many sorts of farming. In the summer the air in the fringes is throat-cracking dry, but moister than any other place in Wind save the mountain foothills and coast. When it rains it pours, hard, and for days before finally letting up. Flooding is a grave concern for inhabitants of the Fringes when the rainy season comes, and each year many die despite anything they can do. Desert flowers bloom, following the devastation. 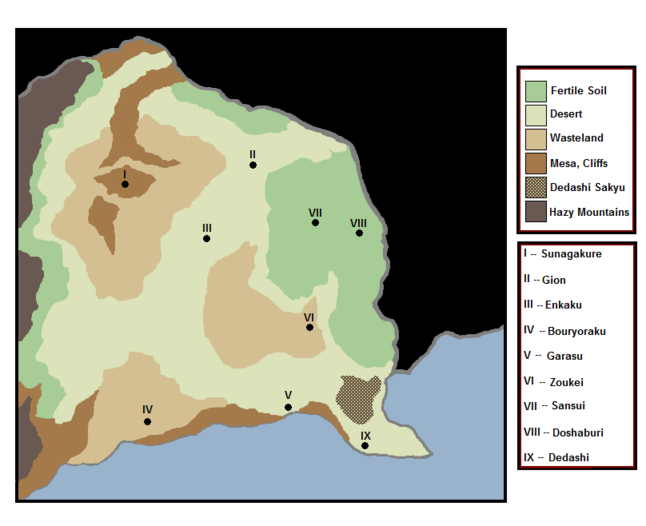 The Wastelands: There are three Wastelands, the Western, the Eastern and Southern Wasteland. While in radically different positions, each is plagued by much of the same weather as the others. They are true deserts. For miles around the ground is cracked and barren; soil completely unfit for farming or cultivation of any kind where it is not rolling dunes of sand. Great rock formations, sandstone monuments with more in common with mountains than boulders mar the landscape, rending the horizon with their jagged edges as far as the eye can see. Under each Wasteland, somewhere, there is an enormous reservoir of water that, properly harnessed, allows for cities to thrive. Sunagakure, Zoukei and Bouryoraku are the only signs of civilization present in all of the Wastelands. The days are blazing and the nights are freezing. There are no seasons, only the constant cycle of extremes, night and day. Rain in the Wasteland falls once a lifetime, sometimes longer; always it has been thought to represent great changes to come. Sandstorms on the other hand are weekly occurrences. The Center: Between the Wastelands, things are calmer. There are fewer oases than in the Fringe, but though the groundwater does not run in so many places here, those places it does runs very deep indeed. Roads run along the underground waterways like the threads of a spider web, with little villages and larger cities sprouting along them like weeds. Often they are merely towns that developed as rest-stops for merchants and others along the roads, but sometimes they develop into something more. Life exists along the roads where the water has broken through or is close enough to the surface for plants to draw it up and sustain life. Farming is done here but it is nowhere near is prosperous as along the Fringe. But the Center boasts the fastest growing population. People throughout Wind migrate to the cities there, making the Center the heart of urban life. The Coast: Wind’s Southernmost edge meets the ocean. There are few beaches here, and the few it has are new-made and made more of stones than Sand. The rest of the coast is high rock face the ocean throws itself against, day in and day out. There is a rough sort of life out here, palm trees that cling to the edges and pray that enough of the water will reach them to let them grow. There are two seasons along the Coast. Wet and dry. The dry is warm but not scorching, and there is more moisture in the air than most other parts of Wind. The wet is a time of raging storms that threatens the hardy life that grows there as much as it helps. Sangakuchi no Moya: The Hazy Mountains are so named by the inky black mist that drifts between the peaks and flows down to their feet. They begin up in Bird Country and stretch down all the way to the coast. It is a lush place where the haze touches the earth. Lush forests grow here. But no wildlife larger than a swallow seems to thrive here. Many groups have attempted to set up villages on the foothills of these mountains and take advantage of the forests. Most vanished and those who did not returned unsuccessfully, for reasons they could not describe. The Sangakuchi no Moya are considered signs of ill-omen, hated and feared by the people of Wind. Most spend their lives pretending they do not exist. Sunagakure is housed in a cradle of sandstone valley. Mountains of pure rock and sand ring around the entire village with a breach in the southern end. Signs of openings in the north, east, and west show there were once gaps in the cradle as well, but have been artificially jammed up and effectively sealed. The walls of the village are constructed in a graduated pattern, and a great number of Shinobi patrol the walls and the mountains frequently, rooting out all would-be invaders. It is from these mountains that they often get their resources for their buildings. The south gate, in light of the Suna no Soushoku's death, has been christened "Seishoumon" (Victory Gate), and is the only known way in or out of Sunagakure. Seishoumon, along with the sandstone ring, is the pride of Sunagakure's defense, and with only few exceptions in its entire history, has repelled every invasion that has come onto its doorstep. Sunagakure itself, while a sprawling village, can be difficult to locate if not accustomed to the terrain and environment of the country. Sandstorms can easily obscure the any visible sign of the village, even if it only lies five hundred meters away. It is within the strong gales that Sunagakure takes its disguise. Sunagakure was developed in a multi-hub system. The inner hub holds the administrative buildings, with the Central Administration Dome at the exact middle point of the entire village. The statues that were once on display in the courtyard have been moved to the chamber of the conclave within the dome. Other support services are also within the inner hub. The middle hub is composed of Shinobi services - the main barracks, the Academy, a vast library, training grounds, and a cemetary with a giant glass obelisk with the names of the fallen are all a part of the middle hub. The outer hub is by far the most civilian in nature. Residences, family-run businesses, and so on occupy most of this exterior ring, though for protection, many Shinobi guard posts have been erected throughout the outer hub. Many of the buildings are connected by shaded halls and passages, though a quicker means has been developed through short walkways and bridges that span from one building to the next over an alleyway. All buildings in Sunagakure, like most in the entire country, are composed of cement and sandstone mixtures - known as "adobe" bricks. Open spaces for windows are chiseled into the features of the stone skyscrapers, and an impressive skyline highlights the city of Shinobi. During the day, the window spaces are left open to increase ventilation and the circulation of cool air, but during the freezing nights, wooden panels are lowered and latched to seal up openings and prevent heat seeping out. Technology in Sunagakure is very likely at the highest level in the country. Most of it is aimed towards medical and research facilities, though a basic intranet computer network has been established for database storing. Power lines run from building to building, keeping the various generators alive and running. A primitive telephone system had been hammered out within Sunagakure, but many people still rely upon the use of hawks and falcons to deliver written messages - this is the system Sunagakure still uses to send word to other countries. Research continues on jutsu and technologies that can be fueled through implementation of chakra, seen in current examples such as KATA's airships, more advanced networks for communications and data storage, and even 3-D imaging/hologram technologies. The largest and most influential city in Wind aside from Sunagakure herself, the capital, lies along the line between the (comparatively) lush plains of the Fringe and the vast sands of southern Wind. The metropolis—and it is a metropolis—can be properly broken down into two parts. The High City and the Low City could each stand for individual representation in terms of both population and lifestyle; and so to truly understand the city as a whole you must know the relationships the two halves share. The High City is made entirely of limestone, and always has stonemasons on hand to make sure the grandiose designs and intricately constructed buildings are as impressive as they were on the day they were first carved. The wealthiest merchants trade here, and most businesses in the country can be traced more or less to these grand palaces and those who reside within them, corridors lined with good Garasu glasswork and exotic tapestries. Plots and designs aplenty may weave themselves in Enkaku, but there is nothing subtle about how men operate here. While Enkaku may seem a calm river’s surface with swift undercurrents, High Gion contains rapids that can and will smash you to splinters for a second’s indecision. A hard life and pressing times have forced Wind's merchants into the most convincing hagglers; many a unwary diplomat has left Gion feeling lucky that he still had the shirt on his back and shoes to walk in. Within high sandstone walls, Gion lives for other nation's trade, and is the very center of foreign affairs, which the denizens of Wind see less as a diplomatic endeavor and more as the hunting of unwary prey. The merchants of Inner Gion have pride enough for Kages, and with tongues smooth and slippery as butter. Most imports to Wind come through these means, and the merchants see themselves as the providers for the rest of the country. The Low City began its emergence when Gion's walls were first raised. Many servants, lower merchants and others who were recruited and needed by the High City had no room to live inside the walls. So, they built their homes outside. And people set up to provide for those people. From there it exploded, a vast suburb expanded around the entire city. What is bought in the Inner City trickles down into the streets here, where hawkers cry out their wares in crowded streets, striking deals with still other merchants to arrange the food's delivery to other villages across the country. Built of good sandstone at best and creaking adobe at worst, the 'commoner's' city spreads out to near twice the size of High Gion, with a population nearly five times that of their richer cousins. What is kept so assiduously from the finer section of the city spills out here; men, women and children stricken by poverty beg at crossroads, and the sound of mourning intermixes with the snorting mules and camels. The noise of the busy capital city fills the air to bursting. Those in Low Gion see those behind the walls as rich aristocrats swimming about in their own money, while those of the High City think of those without as uncultured fools who might disgust their costumers before they walk in through one of the cities three gates. The tension between the two factions is palpable, and only those in High Gion are given the right to select Gion's Council of representatives to the Daimyo. And while no one would call those of Low Gion second class citizens, justice always seems to favor those who reside in the High City. Very soon after Sunagakure’s initial establishment, Enkaku village sprung into being. In the center of the country, the storms and rough weather that plagues the other villages are rare. The entire town is constructed out of Garasu limestone; fashioned smooth with delicate curves like the wind cutting across the sand, Enkaku is serene at the best of times, and unruffled at the worst. The wealthier of Wind country residents and their families live in this relatively small village, and so Enkaku has become a haven for the aristocrats of Wind. The heads of merchant guilds, glassmakers, and oil executives meet, in one the cities many zen gardens as they discuss issues that hold significant sway in the country. Despite being the center for many religions in Wind, Enkaku is famous for the many undercurrents within the city. One word said to a servant and by the end of the day half the other people in Enkaku know, and the rest by daybreak. Plots and machinations run wild here, beneath the visage of a city of peace, and those plots keep the city—without a source of income for itself—alive and thriving along with the rest of Wind. Still, if you can ignore the byplay on the heights, a visit to Enkaku can calm the most turbulent minds. So long as it is just a visit. Once Garasu was a rugged village by the coast, the town of Garasu was left completely without resources of any kind, both mundane and complicated. However, the village quickly prospered. Glasswork is the industry of the town, firing and creating the glass ornaments which are so popular in Wind country today. The villa lays strewn across the rocky shoreline of the countries southern end; the town extends far along the edge, roads made of rectangular slabs of sandstone thread through the town in constant curves, with ornate glimmering glass statues at every crossroad. Some houses on the border are made of the fired clay that makes up the vast majority of Sand’s homes, but most of Garasu’s buildings are carved out of the rocky outcropping they call their home, smooth white limestone, shaved out of the earth in intricate twists and complex patterns mimicking the flowing desert dunes, rivaling their greatest export in beauty. Though no city in the country could ever be called delicate by anyone but those who live in Wind themselves, Garasu has a sort of rugged allure to it, the water lapping against the nearby ridges sounding regularly as citizens walk the streets. The people take pride in knowing that they are Wind’s greatest stonemasons, and the world’s greatest glassmakers. Wealthy men and women commission the people of the city for their works. Garasu-made glass has become a sign of wealth and prosperity throughout the world, though especially in the other places inside of Wind. The once abandoned village of Zoukei thrives again, filled to the brim with all the men and women who were kidnapped by the devilish priests have returned to their homes. A great sprawling urban home, made almost entirely of sun-baked adobe, grows without plans or elaborate constructions. The streets are narrow and thin, and only the very rich have so much as a yard to their name. Even thinner alleys spider web between the streets, clotheslines hanging overhead in the greater residential districts. The parks here were neglected when the villagers were kidnapped, and no one has seen fit to clean the urban mess that migrated into it during its days of emptiness. Even visitors that come for the first time can feel the pressure of the economies needs on the people. The country, in desperate need of oil, pulled everything it could from the city. Forced men to work longer, harder; put younger children to work, all for the same pay they had when they had to do half the work. Now that the aristocracy has felt the benefits of having a people underfoot, there is no sign of stopping, and the fear of losing their oil supply stops the other villages from interfering. Zoukei was never a very rich town, but not poor either. Now for the first time in twenty generations the families here teeter on the edge, where an hours work, where the lack of a child’s hand to help, can break their meager livelihoods. Here more than anywhere else in the country save Bouryoraku crime runs rampant. Families that lost their providers somewhere along the line while captured, orphaned teenagers with nowhere to go, and more walk the streets of Zoukei at night. Suicide rates are at an all time high, and none of the news travels far from the village itself. To those who don’t know better, Zoukei is as healthy as the day it was taken from them, and most that do know are afraid to change it. The eastern and northern borders of the country are known to the rest of the country as a lush, soft land. Scraggly rocks and soil covered this half of the country, crisscrossed by expansive canals that draw water from the western non-shinobi countries to feed the dying land, all funded by the previous Kazekage. Sansui and Doshaburi have sprung from this soil. Starting very near each other to the far east, the two towns grew and grew in size until they became so entangled that nothing remained to tell the two apart. Over time, the two cities merged in all but name and representation, and the rest of the country is more than willing to let it slide for what they provide for them. The two cities are responsible for all the farmers spread across the border, of buying their goods at fair and good prices and transferring the goods safely to south, where such growth is impossible. Yearly rains that fall every year here has become a spectacle that attracts people from all over the country who want to see the sky open up to pour water on their faces, and so Sansui and Doshaburi as a close to a tourist spot as there exists in Wind. The Fringe, as it is sometimes called, is littered all about with oasis's and wells that provide for the many farms; date orchards make up the vast majority of the yearly intact, though hardy citrus fruits are known to be grown in areas where water is plentiful. Though most food is still imported, without these two villages and the region they lord over, the country would not be half as prosperous as it is today. This village, despite having been discovered little more than a year ago, has already garnered a shady reputation. The rumors are many, and all bad, but they pale beside the realities. Bouryoraku was first integrated alongside the original townships, but not all the refuges who came to Wind were honest, all those who weren’t gathered here. Organized criminal sects would have ruled the city had they not quarreled so much among themselves; black market dealers and poachers clashed with robbers and thieves, until in the end a single mafia swallowed it all—and Bouryoraku vanished from Suna’s many maps. Only recently did shinobi come across the town, and marked it in the official records whatever the ruling faction in Bouryoraku wanted. The smallest city in Wind next to Enkaku, Bouryoraku lies in the middle of the Cradle of Storms; where the question is not when a Sandstorm will hit, but rather how hard. The city bustles—tall buildings of hard adobe brick giving little protection from rushing winds of desert storms as men and women crowd the streets; faces hidden behind cowls as this murderer or that poacher goes to finish their business. Depraved faces stare out from the alleyways, and children dressed in rags run through the street. Crime rules here. Even the very poor and very young often have their hands in some dirty business or another; though the ‘law’ here is very harsh on those caught. A great stadium, nearly fifty stories tall, can be seen when the sandstorms do not run strong enough to block vision. All those caught, from the pettiest criminal to the gravest murderer—though most are framed innocents—are sent there to battle to the death, where the winners run free after they gather fifty wins. This is an excellent system for the city that gives a rough semblance of justice while providing a small stock of experienced criminals for the village’s own use. Once known as a prosperous fishing villa filled with the most vivid and lavish business, the coastal port town of Dedashi now lives in the shadow of its own legacy. A grievous atmosphere hangs over the city’s hollowed presence, one adorned by thick storm clouds that frequent the sky. Heavy rain is associated with this ghost town, whereas slabs of wooden plagues frame the scenery of the docks closest to the cove. The town has all but been forgotten and abandoned, but serves as a hotbed for mercenaries, rogue shinobi, as well as black market transactions out of Kaze no Kuni. The town docks are in the Southern District. The Eastern District is lined with large, janky warehouses at times used as storehouses for mercenaries’ weaponry—or to conduct illegal business. In the Western District, the architecture resembles more of a residential area with worn out houses and shacks. The Northern District, the smallest of the areas, was once known as the port town’s market, which is now vacant streets and abandoned ambitions. The Docks are lined by ships, hanging limp from anchors like frozen memories in a bottle. Just north of Dedashi lies a great barrier of dunes, a place deemed uninhabitable from the earliest of days. Initially discovered by cartographers during the reign of the first Kazekage, the Dedashi Sakyu were proven to be unmappable. Nearly one thousand square miles of sand piled into running lines of dunes sit on the peninsula north of the dying city, shaped by strong winds and currents of the ocean that constantly change and morph the area’s structure like a kind of deadly labyrinth. With no stable structure to build upon, outposts are virtually impossible to create, let alone small towns or cities. Shinobi, therefore, have a limited presence here, making it a rather susceptible hotbed for criminal and illicit activity. While there are no humans that live north of Dedashi, several insidious creatures do, however. Oversized reptiles, giant snakes, nightmares that belong inside a storybook, all can be found here. But most insidious of all are the bijuuko. Small, demonic creatures made of chakra have laid claim to the land and organized themselves into ever growing packs. No one is sure why they have coalesced recently, but needless to say, Sunagakure has begun making efforts to protect itself and the country at large. With the dunes constantly shifting, very few have made it to the center of the peninsula. It is rumored that one standing structure, a shining, golden testament to the Yondaime Kazekage lies at the very middle, with secrets guarded by demonic creatures. No one that has ever made it to the grandiose pyramid has ever returned, and the structure’s existence appears to fiction at best. The few that do believe though, all know one thing: The structure will only appear to the worthy, and at the pinnacle, one can the entirety of the surrounding coastline. This wonder of modern architecture began construction shortly before the Suna no Soushuku emerged, and finished just after their fall. Kessoku was built to honor unity among the peoples of Sunagakure; an industrial project that extends from the High City of Gion into what once was one of the darkest ghettos of the Low City. Long timber beams imported from far off lands make up the bottom of the stadium; placed on a hard sandstone foundation, nearly thirty meters below the natural ground level of the city. Here water is pumped, casks of oil from Zoukei contained until the braziers need lighting. The genin competitors wait here before their matches are announced, and the unfortunate ones nurse their wounds here amongst the beams while the victors battle above them. All the necessities that the people of Wind don’t necessarily need to see are taken care of here. On ground level, adobe bricks covered by a thin layer of limestone mark the entrance to those of the Low City, stairways leading further upward to their seats. More important is the grounds themselves; fed by complex aqueducts below ground, the fighting grounds themselves is a miniature oasis. A stream clear as fine glass runs through the center of the arena, feeding a small oval shaped pond fifteen meters at the longest, and deep enough to wade through. Enough to feed several palm trees springing from the artificial soil, and fronds that skirt the water’s edge. Yet there is no grass, no greenery between them. But sand and rocks on both sides; mimicry of Suna’s most rocky alongside its most plentiful. For a shinobi trained here, there is no shortage of hiding places. The fighting grounds are slightly more than half a mile from end to end. The third floor is where the people of the Low City gather; walls that match those of the floor below ring near seventy rows of wooden benches. There are no entertainers, and the only food people here can expect to find here is what you bring into the stadium with you. Rowdy and bloodthirsty, the Low City section is filled with the crowd’s roar, conveniently kept from the competitors before the match ends by a barrier of solid air. At last the forth marks the place of power; people who enter here must cross one of several stone bridges linking the last floor to the High City. Here is where the shinobi, foreign diplomats, and aristocracy are seated for the festivities. For a man with enough coin there is drink for every occasion, the words of announcers revealing feedback given through shinobi caretakers via communications unit resound across the balcony, nearly fifty meters above ground level at the very lowest. The people here can see the fight from a birds eye view, leaning over stone rails designed to prevent the overeager observer from falling to their deaths. Designed to fit perhaps half that of the Low Quarter, the High Quarter teems with bodies while the festivities are underway; though never to bursting like its more common counterpart. One of the country's most famous landmarks resides within Enkaku: The Desert Garden. There are two levels to the desert garden, aptly named the "desert" and the "garden". 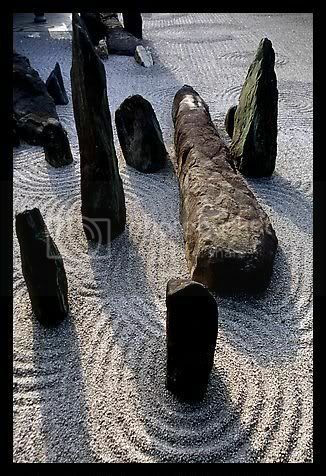 The first of the two comes in the form of zen gardens. Long stretches of smoothed sands with oblong stones and rocks placed artistically throughout provide visitors with a sense of peace and tranquility. Cool ponds of fresh spring water sourced by subterranean streams are often where children can be seen cavorting about on a blazing afternoon while their parents chase after them, scolding them for disturbing the peace. The second of the two levels is the more common form of a typical garden. Plant life of all sorts has been developed here; nearly every type of flora existing in the country has been transported and planted in these stretches of greenery. Greenhouses hold the more temperature-sensitive varieties, and it is within these greenhouses that extracts for herbal medicines can be found. Every so often, wells have been built to give visitors a refreshing drink. After Minoru, the Emissary of Assate, summoned a grand meteor from the heavens in an attempt to decimate Sunagakure, the villager’s and leader—Arisugawa Enzan—worked as a unit to stop the four meteors from destroying their homes. Within the fray, The Eleventh erected the Fuji Musume to both solidify his legacy upon Sunagakure’s history, but to also protect its inhabitants. What were once comets of glass fallen from the heaven and caught in the palms of earth now became a grand structure that would live on above the village for generations to come. Centralized around the Kazekage’s office and expanding above the clouds blossomed a huge Wisteria vine fashioned with the brilliance and towering elegance of an Yggdrasil ash tree. As such, shimmering vines composed of glass hung like chandeliers within a network of glistening beams and pillars that ushered each heavy twining stem together. This allowed Sunagakure to be masked beneath the canopy of the great tree, whereas the hue of glass glimmered shades within the color spectrum of purples and pinks through the small cast of light peeking through the clouds. Sunagakure would remember it as Arisugawa Enzan’s ultimate tribute and testament to his village, one that’d even rival the beauty of his late mother’s crystal fan. 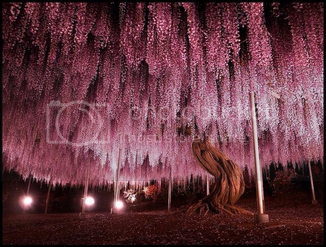 The great wisteria Yggdrasil tree of Sand was born – Fuji Musume. This grand tree hangs over Sunagakure, hiding the village beneath its canopy. Plenty of sand as well as other materials needed to make glass can be found in the Wind Country so a lot of it‘s citizens craft glass products for a living. They are known for moulding beautiful glass sculptures, elegant vases and sturdy dining ware. A lot of money is made by exporting windows and glass decorations to other countries, though Wind’s main financial support lies within its oil. The desert land is rich in minerals such as salt and uranium and large deposits of oil and natural gases can be found underground. These natural resources are extracted from the desert and used by the Wind Country or are sold for high prices to other countries. When the Wind Country was first established, the people were dependant on food imports from other countries because it was so hard to grow plants and raise animals. Eventually they began to build complex irrigation systems so that they could turn infertile, dry land into prosperous farming areas. Growing grass enabled them to feed cattle and livestock. After studying some of the trees that managed to survive the harsh desert weather they discovered that the roots of the trees could extend as much as forty feet underground to get water. They began to drill deep wells and used underground reservoirs. Technology in the country, generally speaking, is limited, but this has improved rapidly over the course of Enzan's first year in office. Organics and biological methods are preferred over the implementation of machines, due to the heavy influence of tradition and maintaining the status quo - never pushing outside one's boundaries - for so many years. Although the Eleventh has started a campaign to raise the level of technology, its growth has been a slow and arduous one. The highest available technology - a limited form of local area network, low-level computing machines, security cameras, and generators - are primarily reserved for use in Sunagakure and the Kazekage's administration. Transistor radios and more pedestrian forms of technology are widely available to the public. The current Daimyo's political platform includes bringing electric power to all citizens of Wind, an endeavor which will require the installation of massive fields of windmills--wind farms--working in connected grids to provide the modern commodity (still considered a luxury in some parts of the country) from Gion to Dedashi and everything in between... except Bouryoraku. The government plays a vital role in keeping the Wind Country safe and in order. While the Kazekage and Sand Council used to take command of the village, Juuichidaime has shaken things up in the chain of command. The Daimyo of Wind, along with two appointed citizens by the mouth of the Kazekage, occupy the three seats of advising the Kazekage. Each throws his own opinion on certain matters that troubles the great leader, who is pressed with the burden of taking care of an entire nation. Though many tasks are delegated to his advisors, the brunt of the work is handled by the kage. While they are called a country, Kaze no Kuni is little more than a group of closely associated city states, with multiple alliances in terms of trade, commerce and military arms. Formerly headed by the Daimyo, the ancestral leaders of each city have made his position little more than an ornamental one. The leaders of the villages—including Sunagakure—are occasionally called to a meeting to discuss issues of foreign policy, international trade and war. The government is a little paranoid about people leaking secret information and they worry about spies so they have set up many guard posts on the boarders of the country and positioned a few around each village. Anyone going into the country has to enter by one of the main roads and pass near guard posts. They must state their reason for coming; if they don‘t they are refused entry. All leading Kazekage do not tolerate traitors (missing-nin) and any ninja that leaves the country without permission is immediately hunted down and accordingly judged. There are several occupations for those who do not wish to follow the path of a Shinobi in Sand, as jobs such as builders, businessmen, hunters, doctors, and shopkeepers are always needed to maintain daily life around the village. Additionally the Wind country has a large research foundation, in which scientists and researches do everything from making cures for various diseases to developing and creating new jutsu for the village. The more boisterous might find life as town guardsmen; the immoral might resort to becoming bandits or Mercenaries. Wind is home to a rich history and many faiths, with ruins and shrines beyond counting. Naturally, Miko Priestesses are fairly common throughout the land, tending to shrines and temples of varying wealth and size. The ancestral leaders, as well as some previous councilors and their families who did not flee the country (or were not assassinated by the Sasori Ryodan) are/were of the Samurai class, holding lands and titles, and maintain the authority to train their own standing militias... so long as they are "loyal" to the Namizuchi Dynasty. Many relatives of these individuals, or those connected to them, are employed as town guardsmen (in officer positions), privately as bodyguards, or both--when not in direct service to their Lord. Some have renounced their titles outright and travel the land as Ronin. Sand is host to a number of a Shinobi families that take pride in being involved in the village and standing behind it. A number of Academy Students come from there, with their family still responsible for their wellbeing and care as they are school in the shinobi arts. Sand also routinely gathers orphans, rootless kids with no home across the Country and brings them to Sunagakure to be trained. They are kept in cramped dormitories, each designed to hold at least a hundred children. A new genin who cannot yet afford residency of their own often continues staying until they can. They begin training early, six years old at most, and continue until their eventual graduation. While no longer policy, the firstborn of any family in Wind could be called forth to become a shinobi. Many shinobi currently residing in Sunagakure were recruited through the firstborn law, including many of the older academy students. Once they are able to support themselves students often purchase a small apartment to call home. It is not unusual for those born to shinobi families to continue living under the roof they were born under until they day they die. Housing is anything but cheap in Sunagakure. KAZE: Genin are given the task of acquiring a scroll from a room down the hall and bringing it back without being spotted by the cameras. SUNA: An SUNA member must spar against another student who wants to join SUNA, and the winner is enrolled. There are cases, though, where the examiners decide the loser of the spar is still strong, but simply lost the spar due to chance or was plainly outclassed by a top-ranked student and had no chance of winning to begin with, and can place the student into SUNA as well, or HARI instead. Those who were Chuunin or Jounin when the Division system was first implemented were simply given a choice between the divisions, or assigned one by a superior. The Kuyamuya and the Yagyou are both Special Forces in Sand, but their themes are so different that it is hard to draw any similarities aside from their access to special organization-specific lists. Other than the fluff that describes their duties, Special Forces are different from shinobi in many ways, and similar in others that many players might not expect. Any Special Forces character may crash a missing-nin’s thread if one of two conditions is fulfilled; if a missing-nin from Sand is present in a thread, or if the thread with missing-nin is taking place anywhere in Wind. Sand Special Forces may not crash a thread if any missing-nin in said thread have had theirs crashed during their past two completed threads. We need to give our rogues time to grow up into monsters. The previous two rules are void if the missing-nin crashes someone else's thread. A Special Forces character may roleplay in threads as normal. A Yagyou member could even set out on a mission with ordinary shinobi while shifted into their alter-ego. New Story Thread opportunities may open up for Special Forces, and they will be among the first considered for S Rank missions in Sand. While not a formal Special Force in its own right, SHINRAI are given all the same privileges that an ordinary SF might have; meaning that a SHINRAI is free to bring teams to crash missing-nin’s threads. To mark the defeat of the Suna no Soushoku, the Eleventh Kazekage instated a new month-long celebration known as The Month of Rejoicing. During this time, those who died in the battle against the priests are honoured and celebrated, while those who lived are often treated with great amounts of respect and praise. It is a time of remembrance, and a time to look forward to the many happy years that are to come in the golden age of Wind. The annual tournament in Gion is a highly anticipated event where spectators from all over the country come to see the quality of Genin their hidden village has produced that year. The prizes for the tournaments are often extremely valuable, ranging from treasured artifacts to even jutsu scrolls for them to study over and learn when they are more experienced. Many Genin remember their Overnight experienced, though it can often range from pleasant to suppressed memories. The Overnight is an event all Genin are taken out on at least once a year. Often headed up by Chuunin instructors, a class of Genin prepare themselves to spend a full two days and one night beyond the boundaries of Sunagakure - though never too far from the gate. Survival exercises, training exercises, all different sorts of character-building activities are held in this time. Some find it a grueling experience, others find it rewarding, though the unofficial motto has become "The Overnight is what you make of it." The Dustmen - This mysterious group consists of retired full robed clad Shinobi, who have dedicated their lives to studying and experimenting with various poisons and venoms found only in the harsh environment of the desert. They are scientists at heart, having created many cures and treatments for otherwise lethal poisons that have saved many people's lives. The Dustmen generally aren’t visited or checked upon for they tend to engross themselves completely into their projects. They are located in an obsidian temple in the desert, where most of their research is undertaken. A mysterious religious sect that existed somewhere in the vast deserts. Their goals and purpose were mostly unknown beyond their belief and attempts to resurrect an alleged god of destruction that would turn the country on its head and make them its lords. Following the defeat of the Suna no Soushoku at the hands of Arisugawa Enzan's leadership, a month-long celebration took place. Alliances made during the Kage Summit, meaning, here are the villages Sunagakure Shinobi are friendly with. Last edited by Seikon; 04-02-2019 at 06:02 AM..
Each Division has access to specific items, with the exception of SHINRAI, who may take any they please. The first of the three official divisions in Sunagakure, KAZE is a branch specifically tuned to information. Whether it be research and development or burrowing deep within an enemy nation as a spy, anything to do with information falls under the domain of KAZE. Before any SUNA movement is ordered, KAZE are almost always dispatched first as reconnaissance and surveillance. They are the eyes and ears of Sunagakure’s Shinobi Corps. A notable fact about KAZE is that amongst Sunagakure, KAZE is the division with the highest success rate in the Chuunin Exams. However, they are not limited to strictly working behind a lab bench or hiding in unfriendly territory; KAZE also deals with more local operations as well. Investigation into crime and suspicious activities as well as locating eliminating the bodies of nukenin (SUNA or HARI accompany them if the nukenin is still alive) are handled by the KEG; lower level messenger missions are dealt to the KAZE trainees, while more experienced KAZE members are often assigned for interrogation if not already out in the field. To be one of the KAZE is to lead a lonely life, for the more seasoned one becomes in the field of military intelligence, the more assignments he is sent out on, consequently spending less time at home. Commanding roughly twenty percent of Sunagakure’s entire military force, KAZE is the numerical minority within Sand’s three divisions. That is not to be taken lightly, though, for any accomplished KAZE division member is highly respected, while trainees are oft smiled upon and encouraged to develop their potential. KAZE is not the strongest division in terms of combat, but they are the most cunning. KAZE holds two titles within its ranks: Investigator and Researcher. While neither are higher in command than the other, they are charged with the duty of raising up Investigator Trainees (or simply “Trainees”) and Research Students (“Students”). Investigators are usually prompted to take on at least one Trainee, as are Researchers with Students, to prepare them for their future line of work. Trainees and Students are not promoted to Investigators or Researchers until they are given the approval of their mentor and of the current administration (Kazekage and advisors). Field work is handled by Investigators, while science, R&D, and administration is handled by Researchers. If it’s acting as a mole in another country or simply uncovering who stole the cookie from the cookie jar, Investigators are in charge of it. While they may not enjoy it, solitude is usually their only partner in high level missions, though from time to time an Investigator is sent out into the field with members from SUNA and HARI. As a widely encompassing title, Investigators are also seen as the police force within the village as they are often the ones to solve crime mysteries in the streets. Researchers almost never see any field time unless necessary to collect samples for experiments (and even then, Students are usually sent to cover the menial chores instead). Sworn to secrecy, Researchers never divulge the details of their work unless given permission. Most innovations come from the laboratories of the Researchers; medications, new puppet models, even poisons to rival the Dustmen all spring forth from the work of these scientists. Last edited by Hitoko; 01-01-2016 at 07:17 AM..
SUNA is the second of the three divisions and is easily the largest; since it requires no specific skills, it’s the easiest of the three paths for Genin to choose between. Any drop out Trainees, Students, Apprentices, and Assistants are sent to SUNA to begin again as a rank and file soldier. Due to this, there exists a wide variety of personalities within the division, from lazy and unmotivated types to brash, bold, or disciplined types. However, SUNA is far from being the garbage can of KAZE and HARI; this division boasts the strongest of warriors and deadliest of assassins in the country. Any and all Shinobi who thrive for combat aspire to be one of their number, for they are the Shinobi who march proudly into battle for their homeland. SUNA basic training is the most difficult to endure out of all three divisions, and those who emerge victorious are congratulated heartily. The heart of all military operations depends upon SUNA. If this division were ever to fall, Sunagakure itself would not be too far behind. In charge of both offensive and defensive manoeuvres, the majority of SUNA soldiers’ time spent is either on training or sentry duty on the village walls. Members of this division – whether Soldier or Recruit – are often exempt from having to take on regular missions as they are expected to be busy honing their skills. This does not mean SUNA members cannot take missions whatsoever, though; they are quite welcome to volunteer themselves for menial assignments like walking a woman’s ten dogs or settling a dispute between neighbours. Forty-five percent of Sunagakure’s total manpower is devoted towards SUNA. At least twenty-five percent is kept home at all times, with a minimum range of ten to fifteen percent kept on the walls and country borders. To compensate for the lack of regular missions – and in the case SUNA members aren’t training as hard as they should be – patrol duty is a normal task Shinobi of this division are required to do at least twice a week. Usually in companies of three or four (perhaps with a member of HARI), the group is assigned a set route to travel along for a five hour shift before returning back to Sunagakure with a complete and accurate half-hourly log. There are currently two existing ranks in SUNA, with a single sub-rank – a unique feature as both KAZE and HARI have one sub-rank for each full rank. Soldiers and Recruits are the majority of the group, with Officers on hand for guidance. Soldiers and Officers are officially placed on the same rank, but if there is a dispute during a mission between comrades, Officers are elevated slightly to be given decisive command. In respect to Recruits, though, Officers are given complete authority to develop, nurture, and push them to their limits and beyond to become outstanding future Soldiers. This is the rank many Shinobi of Sunagakure end up in, whether they wanted to or not. Ranging in age from as young as fourteen to the age at death, Soldiers are only required to be one thing: strong. Preference in Taijutsu, Ninjutsu, or Genjutsu does not matter within SUNA, though companies are encouraged to balance themselves properly to be ready for any type of event during a mission or patrol. While it may seem like it on the surface, Soldiers (on the whole) are far from brainless. Tactics and strategy are topics they are schooled in frequently. A Shinobi who cannot plan is a dead Shinobi, as they say. Without Officers there would not be any Soldiers. Officers keep the Recruits in line and sharp, testing their readiness at every moment. While not exactly Team Sensei, they do dabble a bit in education: tactics of battle, application of strategy, execution of combat, and preservation of discipline. They’re toned down versions of drill sergeants, designed and assigned to make sure no second rate Recruit makes it into the ranks of the prized Soldiers. When not busy with Recruits, though, Officers are no different than Soldiers. Last edited by Kaen; 02-15-2014 at 05:41 PM..
Last, but not least, is HARI. In terms of operations, HARI are always the third to come out of all the divisions. KAZE moves first to gather information and survey the land, SUNA acts on that information and marches forth, then HARI follows up behind to aid and assist SUNA wherever they’re needed - no, before they are needed, which birthed the descriptor of "Early". Almost as if they have a sixth sense, HARI members seem to know exactly who requires the most aid in the field and gets there a split second beforehand. Occupying the remaining thirty-five percent of Shinobi in Sand, they are just as important as any other division. Without HARI, SUNA would not have the stamina to withstand drawn out encounters. HARI brings with it reinforcements, relief, provisions, and medical care all at the same time. Just as both sand and glass are inseparably intertwined, so are SUNA and HARI. Anything not taken care of by KAZE and SUNA is covered by HARI. All healers are placed into this division, as well as Team Sensei and foreign affairs. There are even ex-Soldiers and Recruits who opted out of SUNA and decided to fall back onto HARI; veterans who desire to continue in service but find regular duty too harsh for their bodies also enlist in HARI. Regular mission detail is taken care of by the Shinobi in this division, which is why the members of this division tend to have more pocket money to spare. They see just as much field time as their SUNA comrades, but are not required to go on patrol duty. Tutor and sensei jobs are also part of HARI; Chuunin and Jounin take it upon themselves to teach struggling Genin or Genin teams and bring them up to speed. Any Genin who are unsure of which division they want to proceed towards are placed under the care of HARI teachers, who nourish their latent skills until they are ready to decide where they want to go. Cooks, examiners, Academy teachers, and every other kind of task is under the domain of HARI as well, and while this division may seem to have it easy, Shinobi here are actually required to be quite experienced. Only the best should be allowed to tend to the needs of Sunagakure. Contrary to popular belief, though, HARI is not only made up of doctors and educators; many – if not all – division members are able to hold their own in combat. This is because HARI serves as the reinforcements for SUNA. They strengthen the lines their brethren have created and stop the enemy from breaking past, all while making sure their allies’ injuries and bodily needs are taken care of. It would be foolish for any team to travel without one of the HARI. Even though they carry out so many tasks in the village, there are only two titles in HARI: Medics and Sensei (with Apprentices and Assistants respectively). While both are self-explanatory in what they do, it is their sub-ranks that require explaining. Apprentices and Assistants carry out the majority of the village’s general work; Apprentices handle the patient rounds in hospitals while advanced Assistants take care of Academy classes and private students. However, the examinations to graduate in ranks is a very painstaking process where the Kazekage and his officials pore over every applicant’s profile and assess their overall aptitude to the task. All Medics, Apprentices, Envoys, Adjuncts, Sensei, and Assistants are expected to be ready for a battle call at any moment, though, in case the SUNA division is in need of aid. Healers are crucial to any village, and Sunagakure is no exception. Medics are often either taking shifts in the hospital or minor infirmaries and clinics or are out in the field. While in Apprentice stage, they are taught the basics of cooking to be able to scrounge up a decent and nutritious meal from scraps; sanitation duty is also part of their task, as they, too, are taught about bacteria and viruses. Learned in poisons and antidotes, Medics are in close relation to Researchers – that is to say, the product of Researchers’ work. Most Medics take one or two Apprentices at a time and school them in the art of healing until they are ready to become fully fledged Medics themselves. Sensei deal mainly with undecided Genin. They take on teams of three (like a traditional Genin team) and educate them normally, helping them to practice their skills and realize the division they are most suited for. However, Sensei also take time to teach their Assistants. Assistants, while helping their mentor Sensei educate aimless Genin, are constantly learning from the Sensei themselves to develop effective methods of teaching. Some of the Assistants settle in line to work a job behind the desk, such as Team Planners and Mission Organizers. At some point in their training, though, they are given single students to tutor, and if deemed trustworthy enough, entire classes of Academy students. Only the most successful in the Kazekage’s eyes are allowed to be granted the title of Sensei. Envoys specialize in missions dealing with the public at large. This includes diplomacy with other countries, presenting formal messages, haggling prices with merchants, recruiting Academy Students for training and maintaining good PR for the village. Each Envoy is encouraged to take one Adjunct under their wing. They are taught how to remain indiscreet during negotiations, how to properly haggle, and how to lie and not be caught. Each Envoy puts self-defense in high regard, as they are among the most publicly exposed of the shinobi, and thus the most likely to be attacked. - Note that this is not a fourth division, but a smaller-scale squad. SHINRAI can come from any division, with whatever skills they deem necessary. Even if they can’t beat a pack of wild wolves without resorting to their most powerful techniques, they have been judged reliable and loyal enough to the village to be invited in. Literally translating to "Trust", SHINRAI requires an utmost devotion to Sunagakure, which means members aren't likely to turn traitor anytime soon. It is possibly the highest honour any Shinobi can now be given in all of Wind. As a most exclusive group, many dream to be sent the letter of invitation, but few ever receive it. Members of SHINRAI are often in close contact with the Kazekage, if not his advisors, whether it be to discuss vital information procured out on a mission, or just having a cup of tea. They are not bound to any singular division any more; SHINRAI can trusted to act as any division member (except for HARI Medics if they do not possess healing ability). Not only that, the title of being in SHINRAI comes with it an inherent ownership of permanent Captaincy. Unless the squad member allows another team mate to take leadership over the mission, he is automatically given the reins of the operation. If several SHINRAI are placed on the same team (which is a rare occurrence since Captains are normally spread around to maximize their total influence) the one who was invited first is given seniority while the other is entitled as his immediate second in command. The truth behind the royal sash of the title is that all members of SHINRAI become free to operate as they see fit, even if they have relegated command to someone else in the team - this is the power granted by gaining the trust of the Kazekage. While many outsiders assume that the title within the squad is “Captain” and thus refer to them as such (“_____-taichou!”), there is no actual title for SHINRAI members beyond the one they attained as a division member. However, things are far from easy for SHINRAI. In fact, things get harder for them, truth be told. A greater responsibility is placed upon their shoulders to ensure the success of a mission (or at least the safe return of their subordinates). Criminals who seek bounties for the heads of Shinobi eye the SHINRAI jealously, for their bounty is the highest of all. No, to live the life of a SHINRAI is to live a life of expectation and risk. "Through strength and unity, our nation shall rise through the heavens." KATA, a newly formed alliance within the borders and peoples of Wind Country, exists as a subdivision for all volunteers (shinobi, non-shinobi and the like) who pledge themselves to the Coalition as a vehicle to serve both Sunagakure and the Land of Wind. Additionally, commitment to KATA endeavors are rumored to require international travel on diplomatic missions throughout the world, bringing Kaze no Kuni and Sunagakure's power to the world's stage in an effort to provide relief and aid to those who would require it. As a joint-military organization, KATA places matters of national defense among its highest priorities. Consisting of a small fleet of revolutionary airships designed to carry several tonnes of supplies and infantry, KATA represents the might, resilience, and adaptability of Hidden Sand and Wind Country. Their generosity is reflected in the grand line of their airships as well--as aid in the form of food, water, medicine, weapons, and even entire platoons of ground-units committed to assisting their allies in need. KATA itself is comprised of three separate factions: Hidden Sand, which pioneered the project and supplied a force of shinobi to its cause, the Daimyo of Wind, who funded much of the labor required to implement the project and offered a substantial portion of his armies, and a neutral party which represents the People of Wind who were contracted to assist in the creation of the KATA airships and those who volunteer their services to the continuation of KATA's goals. Each faction has direct control over its own airships, however, coordination between the three factions is paramount to the success of KATA and its mission. It is not uncommon for Sand shinobi who volunteer for KATA to serve on one of Namizuchi Souzen's airships; a local farm boy, with proper training, could find himself in the presence of high-ranking officials from Hidden Sand on Enzan's flagship. The airships themselves are powered through a combination of complicated seal-work derived from original Mujina-clan seals and techniques developed by KAZE researchers for compression of Fuuton chakra and the altering of air density to promote lift and directional thrust without the need for balloons or propellers. An exceptional shinobi would, with knowledge of the necessary seal-work, be able to pilot a craft single-handedly, but this action is typically placed in the hands of three to four Chuunin Pilots, sometimes under an Engineer, working together in conjunction with a Navigator, a Communications Operator and a Captain. KATA airships bear no real armaments, spare for a handful of deck-side harpoons and ballistas, depending on the airship. They were designed primarily for transportation and long-range missions. As such, several observation deck platforms extend outward are various levels of the craft providing quick access to and from the interior where Shinobi, non-shinobi archers and other fighters can latch themselves to a rail and act as the airship's weapons. On the interior, most airships vary depending on what sort of missions they have a tendency to run. Many modifications can be made to various parts of the airships to meet mission-specific needs in little time at all given the reserve of non-shinobi KATA volunteers. On the exterior, they appear as hulking warships on the horizon bearing the mark of the branch of KATA which controls them (painted Sunagakure and Kaze no Kuni's insignia, respectively). All KATA airships are equipped with an anchor to 'land' whilst remaining airborne, a large loading door which opens into a ramp at the airship's rear and a cargo lift which can double as a rescue platform or a troop dispenser when lowered up to 50 meters into peril. The hulls of the airships are constructed from a lightweight alloy, strong and forgiving. They are sturdy and designed to weather both attack and collision. With limited vital areas (the bridge, where pilots coordinate seal-work necessary to maintain flight and the heart, where the ninjutsu-infused gases are stored) the airships are ‘fairly’ easy to defend. Nevertheless, several layers of armor plating protect the inner-most heart of the ships, and this area is surrounded by a vast network of below-deck areas. Ship to Ship / Ship to Village communications are radio akin to standard shinobi issue units, allowing real-time regulation and monitoring of air traffic. A cluster of towers similar to standard SUNA communication poles protrudes out from the bridge at the top of the craft. Additionally, airships are equipped with PA systems to address their own various decks and the same system can be turned outward to address a large surrounding area. Airmen who display competency with basic technology and good communication skills can be assigned a Com. Ops position. Com. Ops uses radio and other means to relay messages between ships and crew. Airmen who display competency with Fuuton can be assigned a Pilot position. Pilots use ninjutsu and apply chakra to existing seals to control the airship per the Captain's commands. Airmen who display a mastery of Fuuton and a working knowledge of seal-work can be assigned an Engineer position. Engineers are exceptional pilots, who counsel and aid both the pilots and the Captain. Airmen who display an exemplary sense of direction and knowledge of the land(s), and the ability to read maps and chart courses can be assigned a Navigator position. Navigators plot trajectory and offer counsel and aid to both the Captain and the Engineer. Airmen who display exceptional leadership qualities can be selected by KATA leadership (GM Approval) to command one of the airships in the coalition fleet. Many Captain positions are currently held by Sunagakure / Wind Country NPCs. Many captains are eager to expand and fill their bridge with experienced Shinobi, Given the nature of their missions, there is a high demand for HARI diplomats (Envoys & Adjuncts) to volunteer for KATA. Additionally, KAZE and SUNA forces find themselves in a unique position of authority as many non-shinobi take up arms for Hidden Sand, ready and willing to rally to the command of a learned, battle-hardened ninja. KAZE researchers in particular are at an advantage as the village moves forward in terms of exploration and the development of new jutsu and technologies. Last edited by Seikon; 01-30-2019 at 09:46 PM..